116' Whisper's blog, news and updates. Cruising itineraries, recipes & menus, media articles, guest testimonials, awards and special events. This winter we have had the opportunity to entertain charter guests in and around Grenada and The Grenadines. This is a wonderful sailing area full of beautiful islands, clear blue waters and amazing people. It is fairly easy to fly into St. Lucia, sail south through The Grenadines and disembark in Grenada. The opposite direction works too! 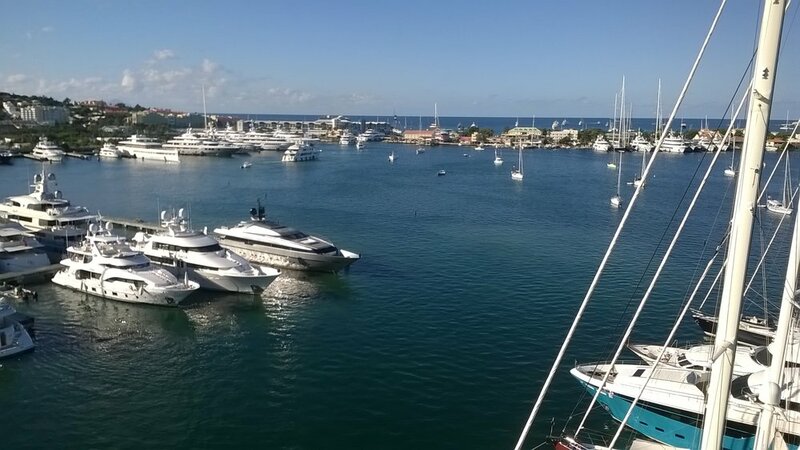 On a clear blue sky day in St. Maarten the crew of Whisper took some beautiful photography of the surrounding area. We hope you enjoy! Leaving the friendly town of Newport on our way to our winter port of St. Maarten. We hope to have you onboard as charter guests this winter! After a winter of cruising the Caribbean Islands, the 116-foot sloop Whisper and its five-person crew are en route to the Northeast where they will spend the summer season cruising to a number of bustling docks and mellow anchorages along the charming coastline. From the untouched islands of northern Maine to the quaint seaside towns in Massachusetts, Rhode Island and Connecticut, New England is a prime summer vacation spot, offering a plethora of itinerary options along the region’s coastline. Welcome to Whisper... a classic 116' sailing yacht built in Amsterdam by Holland Jachtbouw in 2003 and fully refit in 2012. Whisper offers a luxurious private charter vacation opportunity for 6 guests in 3 well appointed staterooms. Her experienced crew of 5 is eager to please and pamper and their professional attitude will ensure a memorable voyage for every guest onboard. Visit our site frequently as we’ll offer updates, videos, favorite photographs, suggested charter itineraries and recipes or sample menus by our outstanding chef. For more information, please contact your preferred charter agent and start planning the yacht charter vacation of your dreams. High end sailing charters on 116' Holland Jachtbouw Whisper. A fun and adventurous vacation style, offering the most discrete and luxurious vacation opportunity for an elite holiday in the serenity of your own private world. Whisper accommodates for 6 guests in 3 spacious cabins serviced by a team of 5 professional crew. EXPERIENCE YACHTING FROM THIS FABULOUS 116' SLOOP DESIGNED BY TED HOOD/TED FONTAINE AND LAUNCHED IN 2003 AT HOLLAND JACHTBOUW. CHARTERING A LUXURY YACHT IS TRULY ONE OF LIFE'S GREAT PLEASURES, AND OFTEN A DREAM COME TRUE. WHISPER'S EXPERT CREW OF FIVE CAN FULFILL THAT EXPERIENCE BY ASSURING THAT YOUR CHARTER UNFOLDS EXACTLY THE WAY YOU DESIRE, WHILE WE ATTEND TO THE DETAILS. Copyright © Whisper. 2014 All Rights Reserved.